"A new art is encoding a new science." The four stairwells that form the four corners of the SV SparkassenVersicherung headquarters in Stuttgart are lit up in red. Now and then there is a flash of white light. On the roof a bright narrow light beam reaches up to the sky, pointing out that this illumination comes from the earth's atmosphere. Sixteen highly sensitive detectors are measuring cosmic radiation in real time. When it penetrates the earth's atmosphere it leaves behind a cascade of invisible particles, which become visible as flashes of light in the stairwells. The project is both an experiment and a piece of light art. It has arisen from a collaboration between Tim Otto Roth, an artist from the Black Forest region, and astroparticle-physicists at the Karlsruhe Institute of Technology. Cosmic revelation is presented in the context of the light art festival Ascents from 17 September until 09 October 2016 at the SV SparkassenVersicherung headquarter in Stuttgart. Opening: 20 September 7 pm, for invited guests in the presence oft the artist and the scientists. Cosmic Revelation makes this hidden exposition to those cosmic energies not only visible, but above all it is translated into a spatial and bodily experience. It is a potpourri of rays originating from space which impact on the earth. Parts are blocked and absorbed by the magnetosphere and the atmosphere. Apart from electromagnetic radiation, e.g. the visible light, also high energetic nuclear particles hit the earth. For instance the hydrogen nuclei ejected by the sun as part of solar wind become noticeable as the polar light. With much higher energies charged particles travel through the galaxies accelerated at almost the speed of light. These completely ionized nuclei originate from exploding stars, the so called super novae. Hitting the terrestrial atmosphere the cosmic particles interact with the atomic nuclear of the atmospheric gazes. The energies released by the collisions is transformed into a variety of elementary particles initiating a particle cascaded – the extended air showers. The former KASCADE experiment which was located at the Campus North of the Karlsruhe Institute of Technology (south-west Germany) measured the resulting myons and electrons. According to its distribution and orientation a cosmic shower could be reconstructed. At the end of March 2009 a giant light field of about 40.000 square metres made science a true experience. As a light installation unique in its size for Germany Cosmic Revelation made the energies of cosmic rays visible originating from the depths of space and interacting with our planet. One or two times per seconds the cosmic energies revealed its existence in bright flashy moments over the sixteen „cosmic mirrors“ – light sculptures especially created for the project. !! !This browser is not compatible with HTML 5.!!! Sixteen detectors in waterprotected housings create an array of 15 by 15 meters on the roof top of the SV SparkassenVersicherung measuring in real time muons and electrons. If such events can be correlated at least in three detectors it is possbible to deduce the angle of the causing airshower on the basis of the slightly varying times. A event monitor programmed in Java translates the measured events for the light visualization and controls by DMX the sky beamer on the roof and the 27 strobes in the stairwells. Background image: The former KASCADE array at KIT Campus North in Karlsruhe. 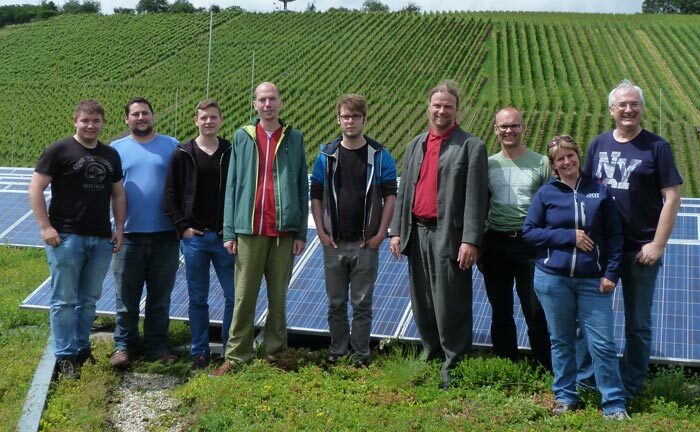 A huge team from the Karlsruhe Institute of Technology (KIT) made the new presentation of Cosmic Revelation possible: Dr. Andreas Haungs (Konzept); Dr. Harald Schieler, Andreas Weindl, Thomas Huber, Bernd Hoffmann, Heike Bolz (technische Realisation); Christian Tesch, Philippe Bruder, Jan-Ole Gosewisch, Alexander Schneider, Daniele d'Ago (Studenten). Group picture of the KCETA team and the artist on the SV building's roof top. The team is part of the KIT Center Elementary Particle and Astroparticle Physics. KCETA bundles experimental and theoretical research and education at the interface between astrophysics, elementary particle physics and cosmology. Large scale international projects for knowledge-driven fundamental research form connecting elements of the various activities. KCETA is a unique platform for studying the smallest building blocks of matter and their interaction as well as their role in the evolution of the largest structures in the Universe.. The artist and composer Tim Otto Roth (*1974 in Oppenau/Black Forest) started his studies in philosophy and politics at the University of Tübingen in 1994. From 1995‒2000 he studied arts at the Kunsthochschule Kassel. In 2001 he was appointed as "Meisterschüler" with Floris M. Neusüss. 2004 he finished a degree in Theory of Visual Communication. In 2014, he received a PhD in art and science history at the Academy of Media Studies in Cologne. In his artistic works he combines art and natural sciences in a unique way. In the projective translation of objects into shadows, the creation of sound environments or the fascination for the nocturnal firmament Roth explores space in different ways. Most of Roth's works can therefore be considered as a plea for a "physics of art". Tim Otto Roth works closely with scientists from leading research institutes as the Max-Planck-Gesellschaft (D), TU Dresden, KIT Karlsruhe (D), the European Southern Observatory, ESA & NASA, Brookhaven National Laboratory (US), Fermilab (US) or KEK Tsukuba (JP). His works are exhibited internationally. September 2016: Cosmic revelation is presented in the context of the light art festival Ascents from 17 September until 09 October 2016 at the SV SparkassenVersicherung headquarter in Stuttgart. First light will be on 17 September. The vernissage of Cosmic Revelation will take place on 20 September 7 PM. Please consult the press page of the imachination projects. 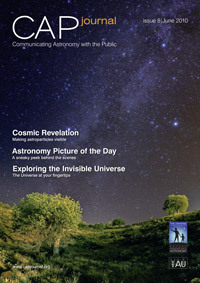 Now online: Geman video feature on Cosmic Revelation by Welt der Physik. "Cosmic Revelation", article by Tim Otto Roth & Andreas Haung in the section Transactions, Leonardo Vol. 42, Issue 3 (2009). Please consult the press page of imachination projects.